Book co-edited by Jeff Rider. 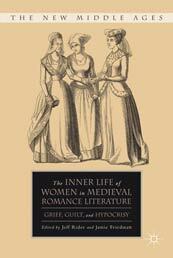 Jeff Rider, professor of Romance languages and literatures, professor of medieval studies, is the co-editor of the book The Inner Life of Women in Medieval Romance Literature: Grief, Guilt and Hypocrisy, published by Palgrave Macmillan: New York, 2011. More information on the book is available online.